At the beginning of March, I was contacted by Peter Rowland who’d stumbled on this site while looking up my uncle, Lyall Watson. Peter lived in Camps Bay, in the same complex that Lyall lived in for a number of years. Lyall invited Peter to drop in for a drink one evening. It was winter but a pleasant evening and they sat on Lyall’s stoep and looked out across the bay. The following is Peter’s account of their conversation. ‘Lyall asked if I had ever heard of the green flash in the sky. I hadn’t and he then told me about Jules Verne and the green flash [this is a reference to Jules Verne’s book ‘The Green Ray, about two people searching for the elusive green flash at sunset]. There was a point at his house, that if you climbed onto his garden wall, you could get onto the roof. So, drinks in hand we climbed up. We sat on the ridge, looking west. The sun was still above the horizon, but as we sat there, he said he could see whale spouts from the whales in the bay. I said rubbish, or a word to that effect! But he knew what he was talking about and after a while, there they were. Thank you for sharing this memory with me, Peter. It’s given me great joy to imagine the two of you sitting on his roof, drinks in hand, looking out at the whales and watching for the green flash. Green flashes or rays occur at sunset or sunrise when a green spot appears for a couple of seconds above the sun or is visible as a ray shooting up from the sunset point. It usually only lasts a second or two and is caused by atmospheric refraction. Apparently it is best seen with a clear view to the horizon and in an area without pollution. Some exciting news with Motherland showing in Queensland Theatre Company’s 2016 season. Thanks to XS Entertainment for the post. Two years later, I have become the other woman – the unlucky one in the statistic of one in eight women developing breast cancer. And yet I am dancing (figuratively – it’s still much too sore to literally dance) because it was caught early, because I am going to be okay, because I feel like the luckiest woman alive. Today’s post is a celebration of good news after bad, and an urgent call to all women to have regular mammograms. I had no lump that could be felt or seen, I was strong and healthy and I was madly busy, busy enough to ignore the first reminder about my mammogram being due. The second reminder prompted action and I booked an appointment. The resulting scan highlighted microcalcification “most probably benign” according to the pathology report but worth investigating further. The subsequent biopsy revealed high grade, aggressive cancer inside one of my ducts, cancer that appeared to be invasive. All of this has happened in the last three weeks. I have been diagnosed, hospitalised, had a lumpectomy and sentinel nodes removed, and now have the wonderful news that they got it all out. I won’t need chemo but will still need a course of radiation (probably six weeks). I am cancer free. 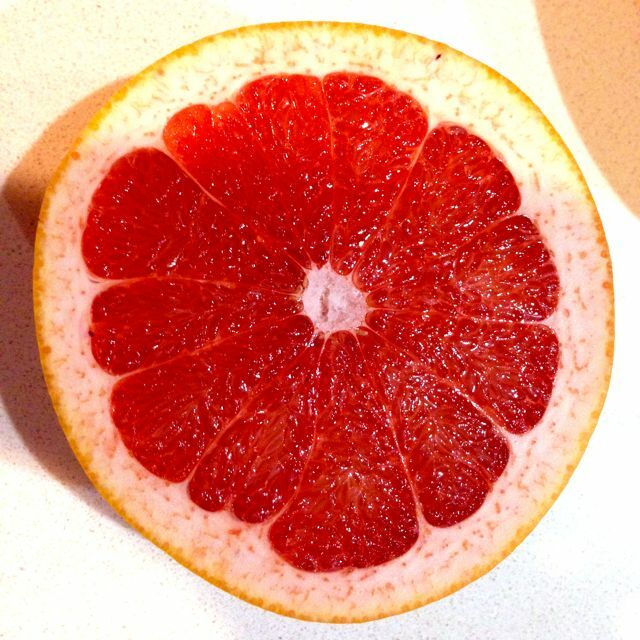 The alternate scenario (and the one that I would have fallen into if I was one of the staggeringly huge 55% of women who don’t have regular mammograms) is that I wouldn’t have found the cancer until it became a lump that could be felt. Given how deep inside my breast it was, that would have taken a long time. Given how aggressive it was, by the time it could be felt in my breast, it would almost certainly have invaded my lymph nodes and, via them, whichever other parts of my body it fancied. Ironically, on the same day that I found out that I had early stage breast cancer, I read an article suggesting that mammograms weren’t useful and didn’t prevent death from breast cancer. I am so disgusted by this reporting. Apparently the machinery they used in the Canadian experiment is outdated compared to what we use here, the technicians weren’t trained in reading the scans properly – or in placing the breast to get the most effective scans – and yet, for many women reading the headline, it will give them a reason not to bother going for their regular check up. That’s part of why I’m writing this post. I want to celebrate my newly regained health and praise the doctors, nurses, radiologists, pathologists and myriad others who found and removed the cancer. And I want to raise my voice and call out to other women to go for their mammograms. As far as breast cancer goes, I’m young (45). I have no family history of breast cancer. I’ve never smoked. I’ve eaten well and lived a pretty healthy (albeit sedentary) life. If it happened to me, it could happen to anyone. Please, please, go and get yourself checked regularly. The minor inconvenience and discomfort of having your breasts compressed is nothing compared to the utter joy of being alive. * The photos are of my breakfast before heading into hospital. 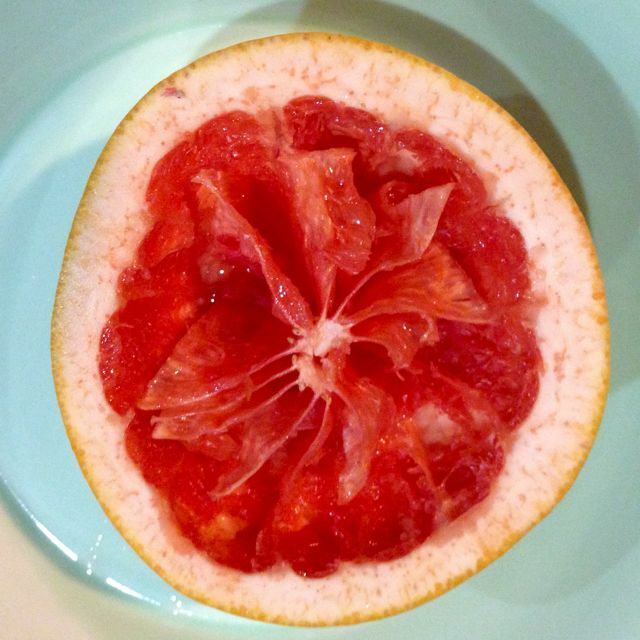 As I sliced the grapefruit in half I became uncomfortably aware of how like a breast it was sitting on my plate. Didn’t stop me from eating it though! 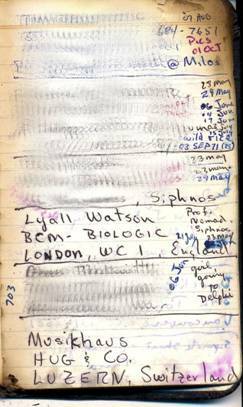 My thanks to Bob Snoijink, who contacted me on this blog to describe his meetings with my uncle, Lyall Watson. Motherland has finished its premiere production. It played in Brisbane at Metro Arts from 30 October to 16 November 2013. Kerith Atkinson as Nell and Peter Cossar as Kerensky in Motherland. Photo bby Al V Caeiro. Rebecca Riggs as Alyona, with Peter Cossar as Chris. Shortlisted for the Patrick White Playwrights’ Award, Motherland is a tapestry of friendship, displacement, home, and identity – a finely-crafted story of the casualties of love, ambition, and politics. CAST Kerith Atkinson, Peter Cossar, Barbara Lowing, Daniel Murphy And Rebecca Riggs. My wife and I just spent the morning tying the final knot in a thread that Dr. Lyall Watson placed in the fabric of my life in 1971 on the island of Sifnos. Yesterday, I read a wonderful article in the Stanford alumni magazine about Alice Coogan. In the closing paragraphs, the author wrote about Alice meeting Lyall Watson on the Orinoco River in 1991, her marriage to Lyall and her death shortly thereafter. My urge to contact Lyall was crushed by a comment in the author’s credits that Lyall had died in 2008. Our effort to answer questions and bring closure (including 2008 obituaries from the UK available in seconds on the Internet — amazing) led to your blog and the invitation to share stories about Lyall. Your blog makes it clear that my brief, chance encounter was not as unique as it felt. Clearly, his charismatic aura provided instant connections wherever he went throughout the world. His omnivorous approach to science provided him with synergetic insights unavailable to many. I was on a six-month walkabout to my home in San Diego from Mombasa, Kenya where I had debarked from a sabbatical leave oceanographic expedition. 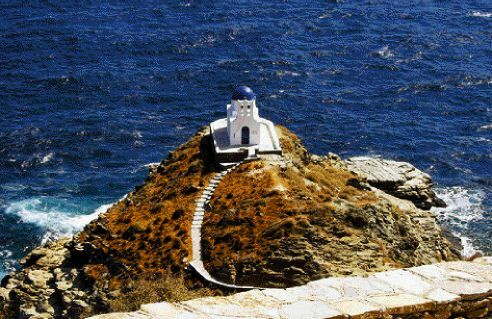 Lyall arrived in the port of Kamares, Sifnos – white pants and a canvas sea bag as I recall — on May 21, 1971. He presented himself as a professional nomad and we traded the usual information that travelers do. I connected with him again that evening as we participated in Kostas Name Day celebrations. Everyone in the village named Kostas has an open house with food and drink. He was so worldly and I such a novice that I didn’t realize until today that he was seven years my junior. As we moved from party to party he told me of the house he built from scratch in Mozambique. He harvested the wood for the structure, melted the sand for windows and forged the nails to hold it together. In the end, he was so sick of it that he walked off and left it. He was in Greece for a reunion with a Russian countess at the Temple of the Athenian Zeus at midnight on the Summer Solstice. Their initial meeting had been nine years prior. They parted without exchanging contact information, but agreed to meet again three years later at a given time and place. That reunion took place – she was now married — and they agreed to meet in another three years. At the second reunion she had children and this was to be the third reunion. Fascinated by the story, I gave him my post-solstice mail drop and requested a report. I received a postcard from him when I got to Copenhagen that an era had ended. She didn’t show up and sadly, of course, no further information would ever be available. 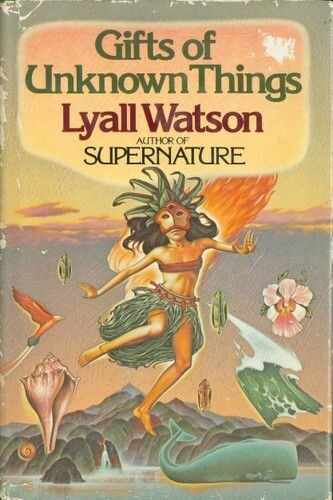 As brief as my encounter was, Lyall and I exchanged letters a few times and he sent me a copy of Supernature when it was published. Reading it with my bride, other of Lyall’s books and the stories above, gave her a sense of having met him as well. Since then, news of his publications and adventures has occasionally appeared and we have appreciated his incredible skill with knowledge, people and institutions. We have lost a great spokesperson for the joy of curiosity and exploration. Unfortunately, I have no pictures of Lyall in Sifnos. In the non-digital days of expensive film and postal service only, I did little more than exchange addresses with interesting travelers I met. I regret that I have no photos of Lyall to contribute to your blog, I found several here, in particular those of Louis Egan (July 26, 2012), that show him as I remember him. Many of the posts make me envious of those who were destined to spend more time with him than I did. The only evidence of my connection with Lyall is this entry from my traveling address book. It’s a bit charred around the edges because it was in a metal box when our condo burned down in the 2003 San Diego wildfires. Thanks for starting the blog – a wonderful tribute to your uncle and a gift to those who respected him and were changed by his writing. I have appreciated the posts from people who knew him far better than I and it has filled in many missing strands in the Lyall Watson thread of my life. Good luck on your projects, and best wishes. Here is another recording from Keith Williams. In the recording, Lyall talks about his fluency in speaking monkey. 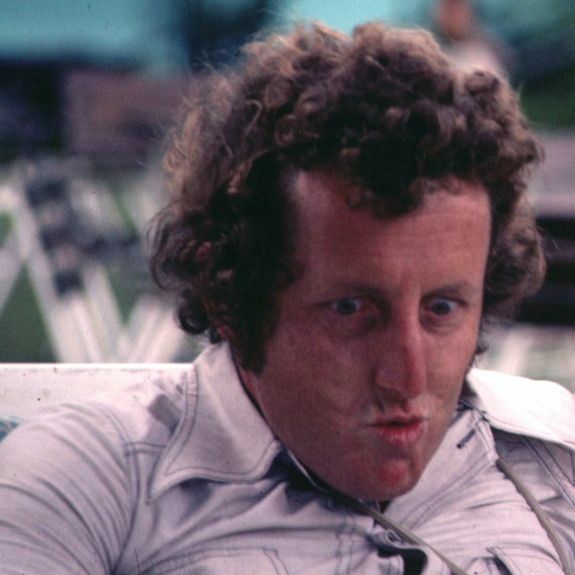 I’m not sure if that’s what he was demonstrating in this photo (taken on a family holiday in 1974), but it comes close! I hope you enjoy listening to this recording as much as I did.